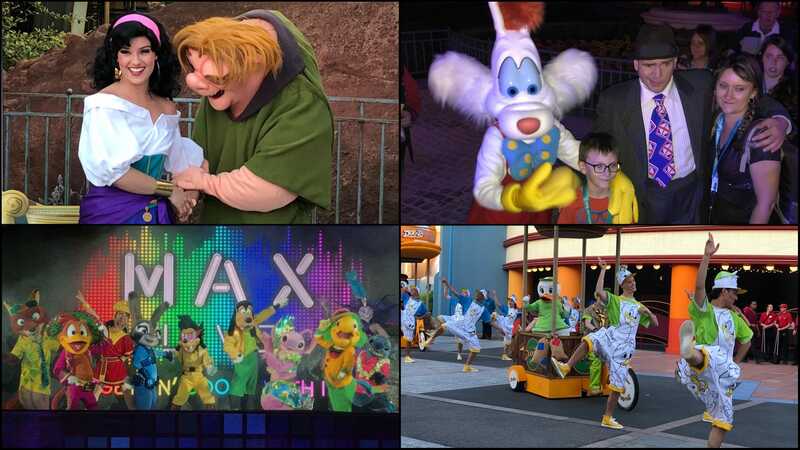 Specially imagined for Disney fans everywhere, Disney FanDaze launched its first ever special-ticket party at Disneyland Paris for one night only this past Saturday, June 2. Disney had announced fans would be able to meet more than 50 Disney Characters, but the final total ended up nearly being 100! Meet and greet stations were scattered all around the park, with character times being from 8 to 10 p.m., then again from 11:30 p.m. to 1 a.m. The map only listed characters who had dedicated locations, while some, including ones from Roger Rabbit, Aristocats, Meet the Robinsons and more, were roaming around in unannounced locations. The Dance Your DuckTales Parade featured some of Duckburg’s famous ducks, including Scrooge McDuck, Huey, Dewey, Louie, Launchpad McQuack and Donald Duck on their hot air balloons, while more than 40 performers danced down the street. Featuring the first-ever Disney Parks appearance of Ortensia, this show saw Oswald the Lucky Rabbit and Ortensia coming to Hollywood Boulevard with dancers in the Roaring Twenties. Special behind-the-scenes opportunities took place in the Animagique Theater featuring Walt Disney Imagineers. We attended one featuring Portfolio Creative Executive Tom Fitzgerald, where he made some announcements about the upcoming refurbishment of Phantom Manor. The one we didn’t attend was about Duffy the Disney Bear. There was so much to see and do, no one person (or two) could see it all. This nighttime spectacular seemed to be the highlight of the event for most guests. Starring Max Goof in a new outfit inspired by Powerline from “A Goofy Movie”, this show featured an all-star cast including Goofy, Judy Hopps, Kuzco, Stitch and more. From bright lights to awesome music, special effects to a rockin’ dance crew, more than 30 new outfits were created especially for this show. This was the ultimate way to close Disney FanDaze. Every single character that made an appearance during the event took part in this special parade, giving fans a last chance to grab a photo of characters they missed. And this wasn’t even everything that was available to do at Disney FanDaze! Fans could also take part in Jumba & Pleakley’s Mission: Stitch, PJ’s DJ Party and Oswald’s Sing-Along Challenge, see live musicians playing at Disney Studio 1 and Place de Rémy, enter a raffle to win a dream night in the Sleeping Beauty Suite at the Disneyland Hotel, learn how to draw from a Disney Legend and so much more. There is no word if Disneyland Paris will hold another Disney FanDaze event, or if it will take place at other Disney parks around the world, but keep an eye on FanDaze.DisneylandParis.com and AttractionsMagazine.com for more information in the future. We’ll also have video highlights on the June 14, 2018 episode of “The Attractions Show”.